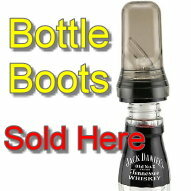 These Bottle Boots liquor pourer covers are a fruit fly force shield for your premium bottles of booze! Each cover in this set of 12 is made of a flexible, durable poly-plastic blend that is designed to fit snugly over any liquor pourer you've got. Use them to easily protect your spirits from moisture, dust, and flying pests of all kinds. With these liquor pourer covers, you'll reduce end-of-night clean-up time without sacrificing an ounce of your sanitary sanity! In stock and ready to ship. Features: Made of flexible poly-plastic. 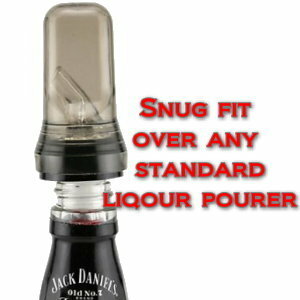 Easily protect your liquor from debris and pests. Makes closing the bar a breeze. 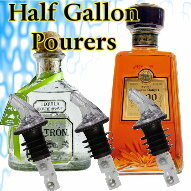 Specs: Dimensions: 3"L. Includes: (12) Liquor Pourer Covers. Available in Black colored polystyrene. 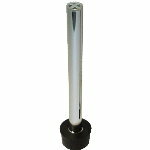 Made of a soft, flexible polyurethane, the Kover-All dust cap fits a wide assortment of pourer brands with or without a collar. This is an ideal dust cover for control of insects and debris. We purchased one package and quickly realized how well they worked and we needed them for both bars. With these covers and regular cleaning we are fruit fly clear! The best way to keep the friut flies out!